We've just scored some exclusive goodies from the production company behind new Turkish thriller, EV. Not a full trailer quite yet, but they've put together a special English subbed teaser for Quiet Earth readers and given us first look at the film's final poster art you see to the right. 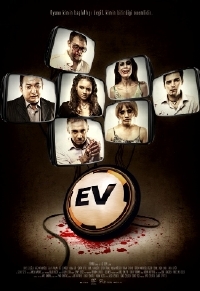 EV is the name of a famous Turkish TV network and the film is the first to come from sibling directors, Caner Ã–zyurtlu and Alper Ã–zyurtlu. Watch out for these guys. EV takes place in the midst of a reality TV show similar to Big Brother. Except, this show is stopped dead when a gunman seals the contestants inside reality tv hell. Check out the English subbed teaser for EV after the break and keep it glued to QE for more details as they become available.